-Training and preparation is provided by your friendly Australian Parachute Federation qualified tandem skydiving instructor. Assistance in Swedish, Japanese, Chinese, German, French and Korean can be provided. -Enjoy a scenic flight of Ulura (Ayers Rock) and take in the view of Kata-Tjuta (the Olgas) while your aircraft climbs to jump altitude. -It's jump time! You and your tandem master will exit the plane and enter the rush of freefall reaching speeds of more than 200km/h over the Red Centre of Australia. Then the parachute opens. Now you can catch your breath and start to take in amazing views in all directions, including the world famous Uluru (Ayers Rock) and the spectacular Kata-Tjuta. You can book The 3 days / 2 nights Rock Tour & Uluru Tandem Skydive and we can arrange pick up and drop offs for you. For passengers on the 3 day Rock Tour we will arrange the pick up and drop off points at the time of the booking. Choose from six time slots throughout the day for your skydiving experience, including the chance to jump at dawn or dusk when the red rock glows with the light of the sunrise or sunset. 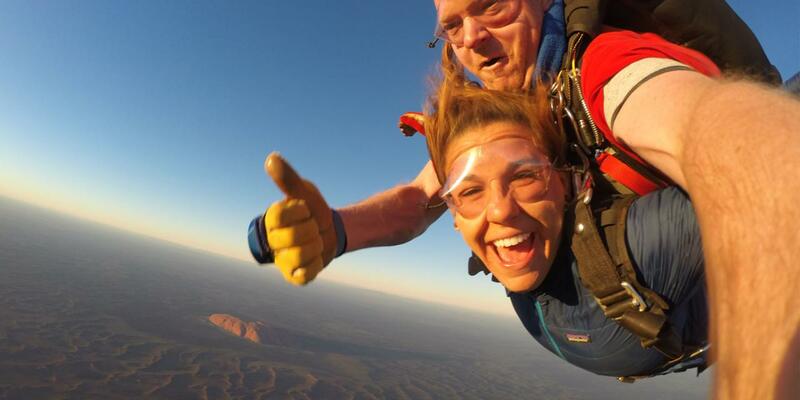 No experience is needed, simply bring your sense of adventure to skydive at Uluru (Ayers Rock). Preferred group size is 2, 4 or 6 people. Minimum group size is 1 person. The aircraft takes 2 people at a time. Doctors certificate may be required for some medical conditions. THE PRICE FOR SINGLES BOOKINGS IS DIFFERENT TO BOOKINGS FOR PAIRS!